Brilliance Audio, 2008. 1 compact disc. 1 hour. A children’s story set to narration and orchestration? What a charming idea! This CD makes for lovely listening. Jim Dale’s incredible performance, with such astonishingly different voices for different birds, makes for a delightful listening experience. I’m afraid this is no Peter and the Wolf. The story, about a parrot who repeats the line, “Shoes are for the birds!” and gets all the birds of the world to believe it, seems much more lightweight than Peter’s story. The music, while nice, didn’t seem as memorable to me. But then, I only listened to it once, rather than the thousand times I must have heard Peter and the Wolf. 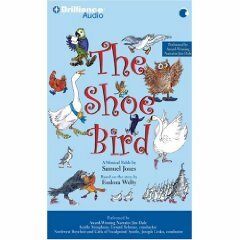 However, it does provide plenty of opportunity for the orchestra to give different themes to different birds (as well as Jim Dale’s different voices). There’s even a cat who threatens the birds, all weighted down with their new shoes. This entry was posted on Sunday, January 25th, 2009 at 12:13 am and is filed under Animal Characters, Audiobooks, Children's Fiction Review, Fantasy, Starred Review. You can follow any responses to this entry through the RSS 2.0 feed. You can leave a response, or trackback from your own site.